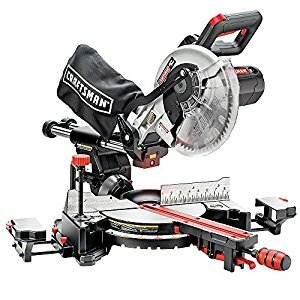 The Craftsman 21237 with a 10″ sliding compound mechanism is a portable, lightweight miter saw that’s powerful enough to easily cut through thick wood. The saw fits well in both home shops and job sites, making it ideal for an amateur and also for someone who has just set up shop. Capable of 4800 rpm spins, leaving behind tight corners and sharp edges post every cut with this saw is almost a given. In this Craftsman miter saw review, we’ll learn more about the saw’s power, blades, and a few other things that make the Craftsman 10″ compact sliding miter saw worth every penny. The saw comes with multiple features. It’s reliable and versatile. It can handle a range of woodworking that goes into making tabletops, doors, tables, and even custom pieces. Also, the saw is fairly quiet during operation when compared to most other saws in its category. The saw works great fresh out of the box as far as angle accuracy is concerned. On the power front, there’s aplenty. The sliding adjustment of the saw is one of its kind; you would hardly find other saws having this feature. The sliding system comes in quite handy when re-measuring is needed to finish a cut. In other saws, this re-measurement has to be done manually, which can consume quite a lot of time. The saw has a laser guide, but it’s not the most useful. In fact, when working outside, the laser is almost useless as it’s not bright enough. This is primarily because of the laser’s positioning. In other saws where the laser is more than handy, the laser source is much nearer to the cutting area. Like most other miter saws, the dust bag on this is also not worth its salt. The sawdust keeps building on the guides/rails time and again. Also, the body isn’t the most premium-feeling. For instance, the handle on this feels quite cheap. Q – What is the maximum vertical height the Craftsman 21237 can handle? A – The saw can cut up to a maximum of 4 inches vertical. Q – What voltage power does the saw need? A – The Craftsman 21237 requires 120 voltage power. Q – Is there a depth stop to this saw? A – Yes, there is a depth stop. Q – How are the saw’s bevels like? A – The saw would pivot left and right horizontally, but just to the left vertically. Q – Is the depth cut adjustable for slotting the wood? A – There’s a screw on the side that can help make the adjustment. The Craftsman 21237 is an extremely potent saw for the price. It’s got a lot of things going in its favor: performance, accuracy, precision, versatility, etc. However, don’t buy this saw with professional woodworking aspirations. If you want something extremely powerful to be used as a primary saw, the Craftsman 21237 is not your bet. But if you are a hobbyist or want a miter saw to accompany your primary, more powerful saw, you may have to look hard to find anything better than the Craftsman 21237.